In the summer there are a lot of people tend to sweat , especially in men . Customers often ask us if clothes were soaked in sweat , hard to clean , how to do ? In fact, this related to fabric components , but we have an easier way to handle, that is lemon juice. When a woman doing housework , clothes contacted deodorant, how to clean ? Do not worry, you can use baby wipes . Red wine spill on a white shirt, it sounds a lot of trouble , right? In fact, it is easy to solve , but you need use white wine ( white win red …lol ). 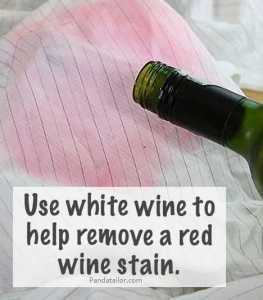 use white wine to help remove a red wine stain. Want tuck wide jeans into boots , in addition to a hose , you also need to look carefully folded trousers . How to tuck Non – skinny jeans into boots. This entry was posted in Clothing Useful Tips and tagged clothing tips, jeans, remove marks, shirts, sweat stains on November 18, 2014 by admin.